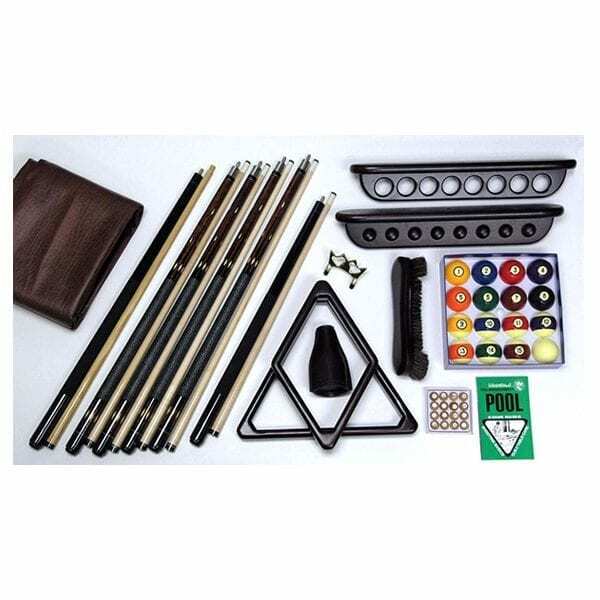 The Ultimate Billiard Accessory kit comes with everything you need for the perfect home billiard game: 4 two piece maple cues wrapped with Irish Linen, 2 piece bridge stick with brass head, 48” short cue stick for tight corners, and matching finishes on: 15 ball rack, 9 ball rack, 10 ½” Brush, and 2 piece wall cue rack. Also includes: 8’ brown durable table cover, leather shaker bottle with wooden tally balls, rule book, and a set of lifetime warranty resin billiard balls. 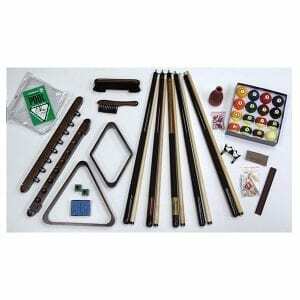 Once you select this amazing billiard accessory kit you’ll want to upgrade the rest of your billiard room furnishings. Trust Fairview Game Rooms to stock everything you need. We offer chairs, stools, Executive Billiard Storage Benches, additional cue racks, and much more. We are confident in saying that Fairview Game Rooms offers everything you need to ensure many enjoyable billiard games in your home, rec hall or club.